Have been watching Cyclone Pam since she first started forming about a week ago up in the tropics. After seeing the track move east and west relative to New Zealand, we are now in the final stages of the storm’s approach and it seems like the center of the storm will pass within 150 km of the East Cape of New Zealand. Recent forecast track maps are pasted below. We shouldn’t see very much over here on the West Coast of New Zealand, but my partner’s family is in Gisborne on the East Coast, right on the beach facing in to the 50 knot south easterlies and 30 ft seas. Could be gnarly for them and we are simply hoping for the best. From Fiji Met Service, valid at 2:17 AM NZDT Sunday 15 March. 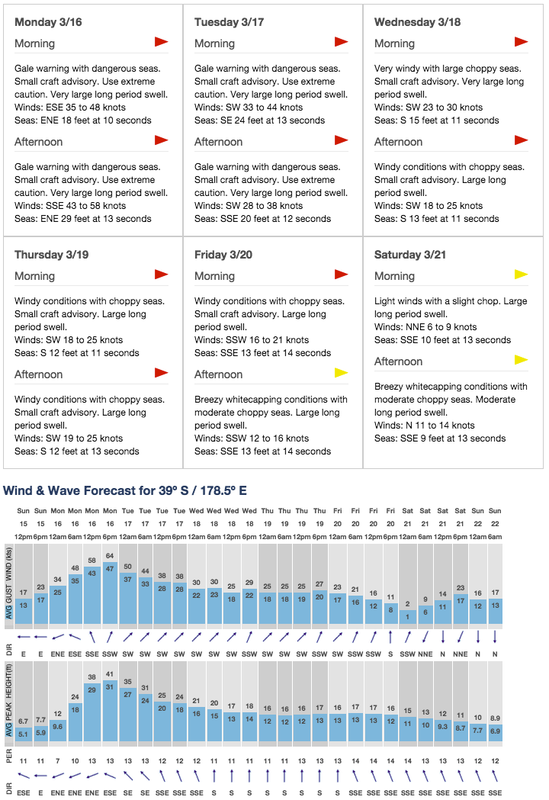 Buoyweather.com marine forecast for offshore Gisborne (39 S 178.5 E). This entry was posted in cyclone and tagged Cyclone Pam, Gisborne, hurricane, tropical storm on March 14, 2015 by jocabo.